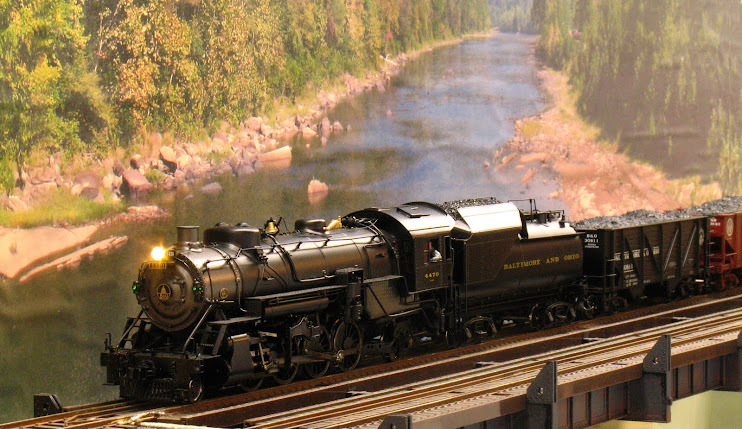 2-Rail O Scale Railroading: Success! After three attempts, I finally got the suspended part of the Cranberry Grade right! 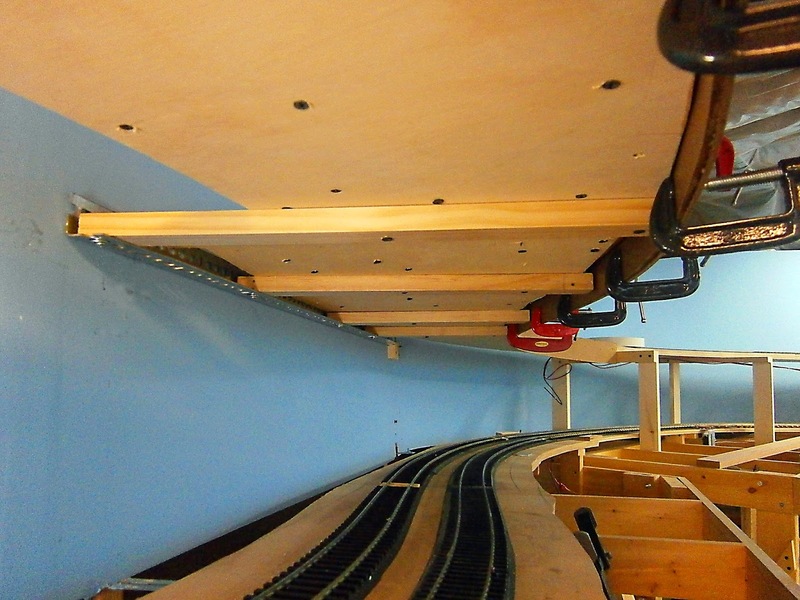 If you have been reading this blog, you'll know about the small section (about 15') of double deck that I have incorporated into the layout as an afterthought (i.e. it was not in the original plan). It allows the approach into and out of lower staging to be visible inasmuch as this is a nice sweeping curve that would otherwise be covered (lower staging is itself an afterthought and not in my original plan). I had made two unsuccessful attempts to support the upper section, which is on Cranberry Grade. The supports obscured too much of the curve below and it looked like peering through a narrow slit at the lower tracks. The second unsuccessful attempt is recorded here: The Twelve Days of Christmas. After two tries, I had to stop and really think out what I wanted to do next. Thicken the subroadbed by adding a 1/2 inch layer below the existing 3/4 inch subroadbed to stiffen it up. Added suspension wires from the outer (aisle) side of the subroadbed up to the floor joists above. 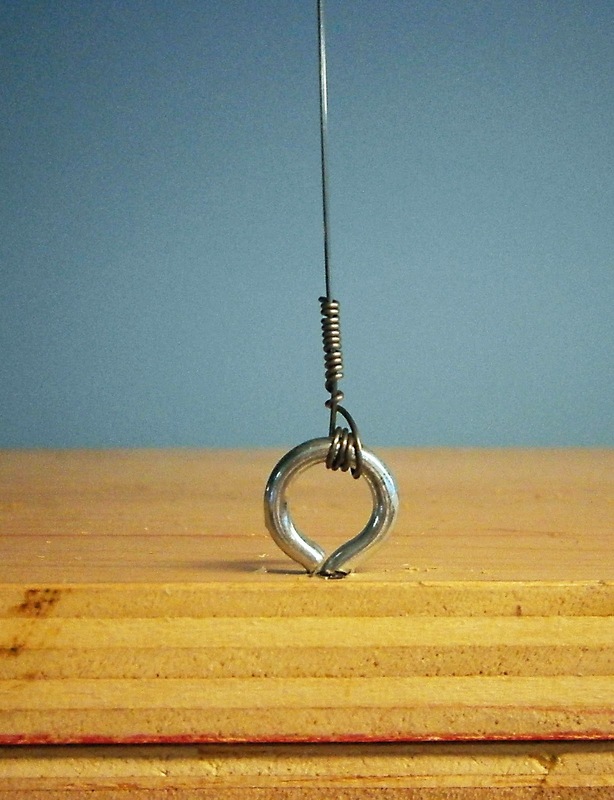 These wires are a single strand of #12 piano wire (240# breaking strength) and only 0.029 inch thick. 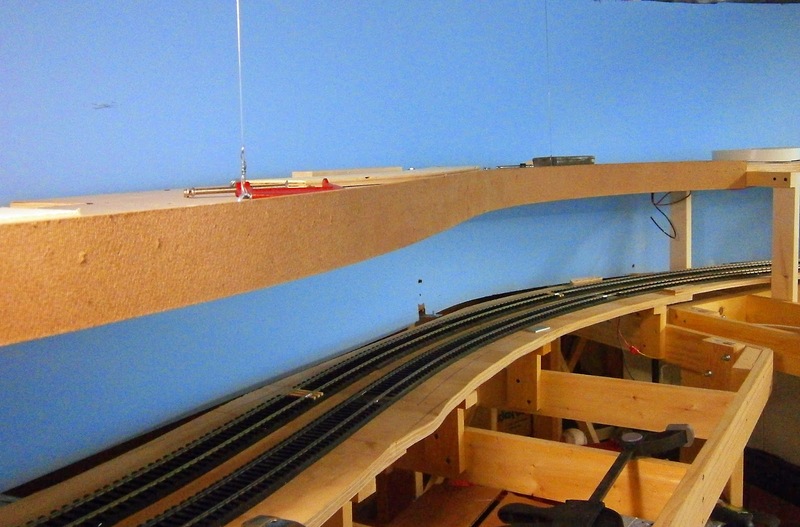 Add 1x2 lumber athwart the underside of the roadbed to act as "beams". Screw a metal "L" slotted angle iron to the backdrop to use as a ledger on which the backside of the beams rests. Glue and brad nail two thickness of 3" x 1/8" masonite to the outside (aisle) edge of the subroadbed to act like the plate girder to stiffen the upper deck. First, I added the additional 1/2 inch of subroadbed along the entire suspended section. 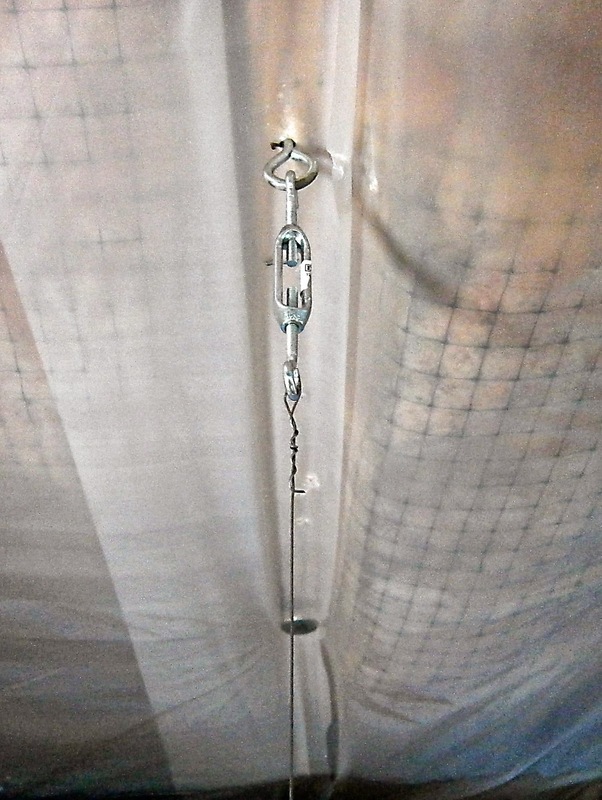 Screw eyes were placed on the outside (aisle) side of the subroadbed and the other end of the wire inserted, pulled taught, passed through the eye a few times and then wrapped securely. The beams and the angle iron went in next. Since the subroadbed was already to grade, and I did not want to disturb it, I clamped the beams to the underside of the subroadbed, fitted the angle iron to the ends of the beams, then screwed everything together. The final product looks like this from the underside. Here the first strip of Masonite is in place on the edge of the shelf. Glue was applied to the edge of the subroadbed and the ends of the beams then the Masonite was held in place while an air nailer drove brads through the Masonite into the subroadbed. The strip was applied with about 1/2 inch above the level of the subroadbed and 2 1/2 inches below. The 2 1/2 inches hides all of the supports below the upper deck and provides 1/2 inch of space on the backside of the lower edge for mounting LED strip lighting. When I first applied this with glue and brad nails from a nail gun, the upper deck still flexed more than I would have liked. However, I had faith in my design and I let it be. After the glue had time to set up, the shelf flexed a whole lot less. In fact, the one thickness of 1/8 inch Masonite would have been enough. But since I applied the Masonite with the rough side facing out, anticipating another layer with the smooth side out, I was compelled to apply the second strip. Here's the second strip glued and clamped in place. Joints between the first and second layer are offset for strength. I used no brads through the second layer for a nice finish surface. I must admit that I am very pleased with the result. The thin upper deck gives the lower level a feeling of spaciousness and openness; and there are no supports below to obscure the view. The Masonite end cap gives this part of the layout a hint of it's finished appearance. There is minimal deflection at the center of the 15' suspended section and none towards the ends where it ties into structure. On the other hand, the suspension wires, thin as they are, will detract from trains on the upper level. And I've already discovered that they interfere with track laying up there. Lessons learned: Increasing the thickness of the subroadbed gained me little; 3/4" would have been enough. One thickness of Masonite as the flange would have sufficed; maybe going up to 3/16" thickness, just to be sure. I have 5 suspension wires unevenly spaced along the 15' span (because of overhead obstructions); not all of them are bearing the same load and I believe that 3 would suffice. 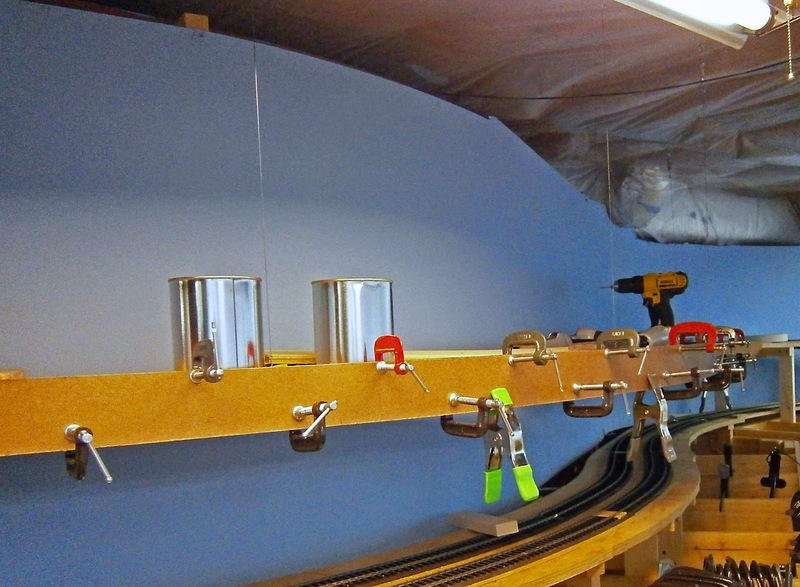 I believe that a modification of this structure: 3/4" subroadbed; 1x2 lumber laid edgewise rather than flat and 3" x 1/8" flanges on both sides of the roadbed for stiffening would make an excellent shelf layout and/or upper deck structure that would only need widely spaced support from above or below. 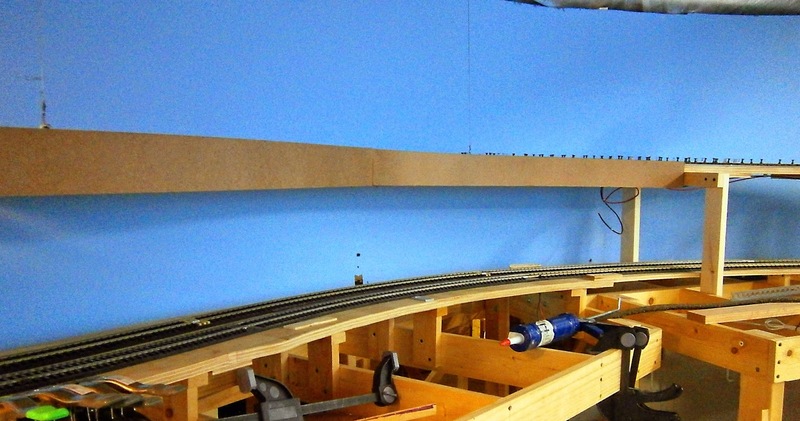 With this major task completed, and all of the turnouts for this stretch of the layout completed, it's a race to the finish line - I think that I'll make it!